S.S. Mokulskii and Pavel Aleksandrovich Markov, eds. Teatralnaia entsiklopediia. Moskva: Gos. nauch. izd-vo Sov. entsiklopediia, 1961-1965. Shipping weight is about 17 pounds; shipping cost to be determined at time of sale depending on destination and method used. S.S. Mokulskii and Pavel Aleksandrovich Markov, eds. Teatralnaia entsiklopediia. Moskva: Gos. nauch. izd-vo Sov. entsiklopediia, 1961-1965. 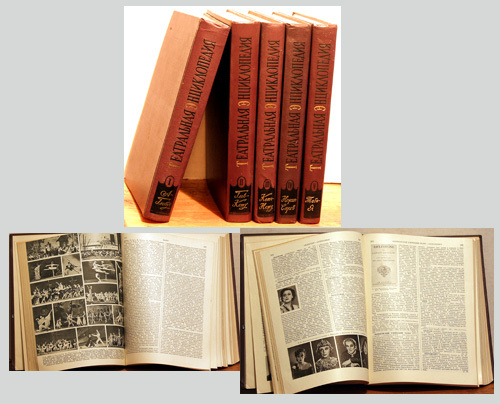 Five volumes, illustrated, portraits. Series: Entskilopedii, slovari, spravochniki. A description from the University of California Library: Another fine subject encyclopedia from the publishing house Sovetskaia entskilopediia, this work contains many biographical entries for dancers, musicians, dramatists, actors, etc. Keep in mind that it represents the Soviet perspective. Entries include biographical data, historical significance and often bibliographical references as well. Entries are signed by the scholars who wrote them and are arranged alphabetically by topic or surname with an index volume that contains a name-subject index, a bibliography of the performing arts, and additional entries. The name-subject index groups people by region and specialty. Vol. 1: 1215 pp; Vol. 2: 1214 pp. ; Vol. 3 1087 pp. ; Vol 4: 1151 pp. ; Vol. 5 1135 pp.